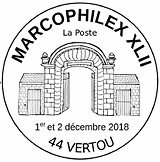 The last French ATM issue of 2018 was released on the occasion of MARCOPHILEX XLII, the annual exhibition of stamps and postal history organized by the Union Marcophile. 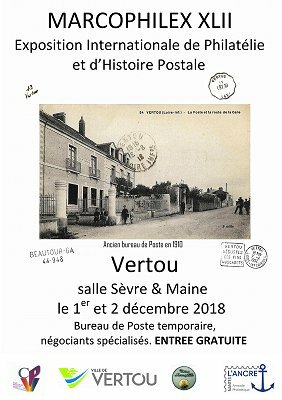 In 2018, this event was held over the weekend of December 1st and 2nd, in the Sèvre et Maine multipurpose hall, in Vertou, a city near Nantes. 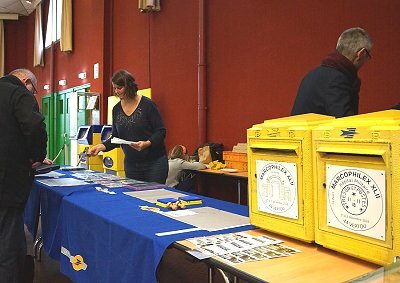 It was co-organized by the local philatelic association, the Club Philatélique Vertavien, and l'Amicale Philatélique de L'Ancre. 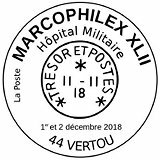 On the occasion of the centenary of the end of the First World War, the 42nd MARCOPHILEX was devoted mainly to military mail during that war. 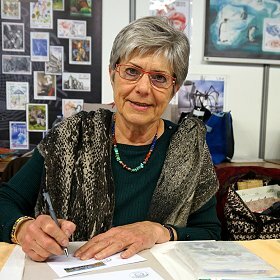 In addition to the exhibition, the organizations scheduled several workshops, and l'Union Marcophile also held its annual meeting. You can read articles on the earlier MARCOPHILEX exhibitions since 2012 both on this website and in the various issues of VARIABLE. 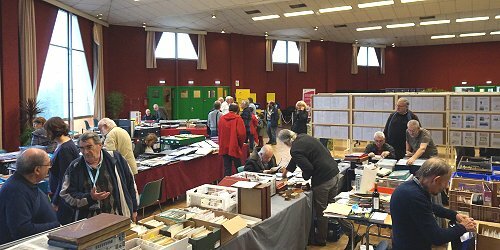 This philatelic event also brought together a dozen or so dealers. 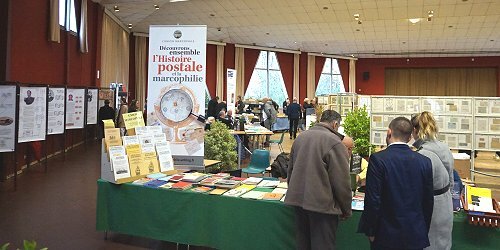 In addition, several philatelic and local associations showed their work and activities to visitors. Once again, Phil@poste released an issue of a commemorative LISA specifically for Union Marcophile. There are now seven consecutive issues for this annual event since the first issue was released in 2012, for the Épernay's MARCOPHILEX (see article, also published in VARIABLE 27). 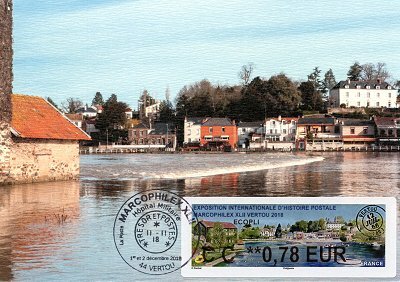 Claude Perchat's, beautiful design based on a photograph by Michel Feyfant, shows a panoramic view of the Chaussée des Moines, with the Moulin Gautron on the left and an old Vertou post office datestamp on the right. The Chaussée des Moines is a dam on La Sèvre Nantaise, built by the monks of the nearby Abbey of Saint-Martin de Vertou around the year 1000. The dam enabled communications between the two banks of the river, while still allowing navigation upstream. They also built a hydraulic mill in operation until 1750, located where the Moulin Gautron is today. 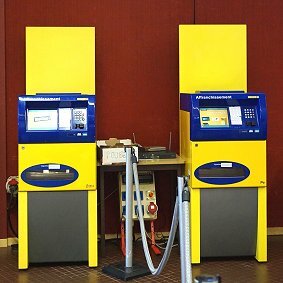 For the printing of the vignettes, La Poste installed two IER LISA 2 XP kiosks next to the usual temporary post office. Phil@poste manufactured 20,000 labels with this design. 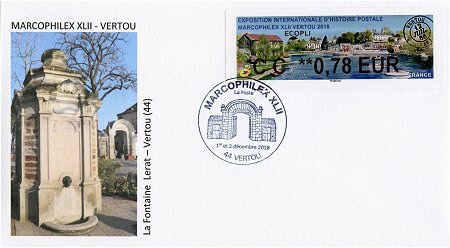 Two commemorative postmarks were available at the temporary post office, one of them featuring the main entrance gateway to the old Benedictine Abbey of Saint-Martin, the only remaining remnant of this building. It can also be seen, in the background, in the illustration of the cover produced by the organizers. 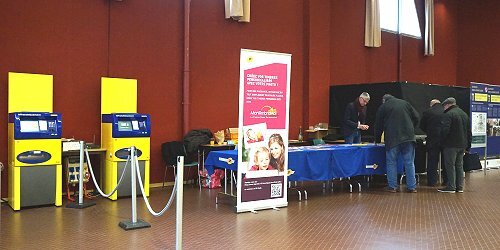 During the exhibition, the two postal kiosks were connected to the postal network and issued variable value stamps as per the current postal program, but -once again- La Poste had temporarily modified the software to suppress the printing of the annoying 2D Datamatrix code and the La Poste logo. It was however, only possible to purchase stamps with face value at or above 0.78 EUR, the current postage rate for economy domestic mail. After the exhibition, the LISA design was also available in one of the IER LISA 2 kiosks installed in the Vertou post office. With the unmodified software, the stamps issued after the exhibition include the Datamatrix code and the logo printed on the right side of the stamps.